Blackberry Ombre Sparklers are one of the prettiest cocktails out there. 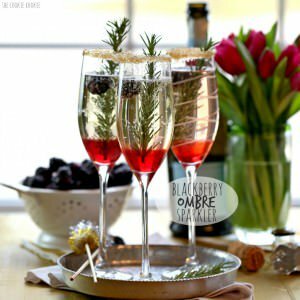 These easy and beautiful Blackberry Ombre Sparkler Cocktails are perfect for Valentine's Day! In a small saucepan, combine blackberries, sugar, and water. Bring to a boil on high heat, and then reduce to a simmer and let cook for approximately 15-17 minutes. The blackberries will become soft and bright in color and a pinkish purple syrup will form. Making sure it cooks down enough is essential to keeping the ombre effect. Take off of the heat and drain the blackberries, keeping the syrup in a separate bowl. Set both aside and allow to cool. Garnish with fresh blackberries or the cooked blackberries, and a sprig of rosemary.